Live, Love, Laugh, life to the fullest. 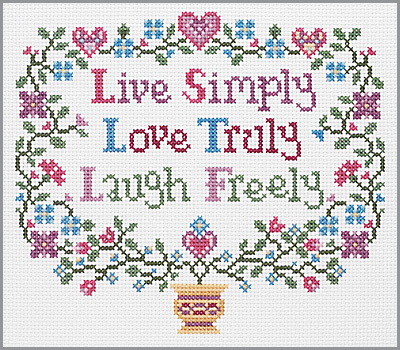 The sentiment expressed in this Counted Cross Stitch Kit from Janlynn sheds a bright outlook on even the gloomiest of days. Each kit contains 14-count Aida fabric, frame, 6-strand cotton floss, needle, graph and instructions. Design size: 8" x 7".